I got about four or five nominations... Wow, I know. So I apologize if I didn't mention your name in the following list below. 1. Thank the blogger that nominated you and link to her blog. 2. Nominate other bloggers and let them know on their blogs. 3. Answer a list of 10 questions. 4. 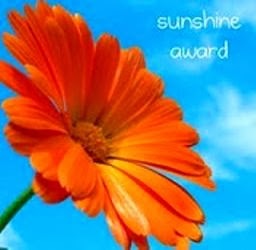 The Sunshine Award button must be posted on the blog. 2. Would you sacrifice your life if it would save that of a stranger's? Honestly, it depends. Not on the person but the situation. Yes, I would take my life for a stranger's, but would I have time to think fast? That's the question. 3. What is your latest goal? I suppose to have goals. Because, well, I'm terrible at keeping goals. 4. Who's your special Valentine this year? 5. What book are you currently reading? Right now I'm reading A Separate Peace by John Knowles for school... But I'm going to start reading The Truth about Forever by Sarah Dessen and The Mortal Instruments: City of Ash by Cassandra Clare. 6. Do you play an instrument? I have been asked this so many times, and almost each time I question my fear. I have narrowed it down to: Losing someone I love. Or the thought of being alone. Those are quite terrifying to me. 10. Favourite memory of school? Um... the one when I didn't have to start school yet? just kidding. But probably when my sister, Lila, and I were in like 1st grade and our tutor "published" these books written by us. That was pretty cool.